Over the Christmas holidays, my daughter lent me the book The Faitheist by Chris Stedman, the Humanist Chaplain at Harvard University. I hardly knew what a Humanist Chaplain was and I was intrigued by someone who would link both faith and atheism in his perspective on life. Make no mistake, Stedman considers himself an atheist, but he is an atheist who appreciates the role religion plays in people’s lives. He tells the story of how he was derisively called a “faitheist” by one of his atheist friends. However, upon reflection he felt the term adequately captured his perspective on life and so claimed the label for himself. Stedman’s story is both challenging and troubling for those of us who claim to be Christians. His story illustrates how often in our passion for Truth, we alienate others without even knowing we are doing it. After growing up in a non-religious home, Stedman got involved with an evangelical youth group while in middle school and even made a typical evangelical commitment of faith. However, this spiritual awakening was accompanied and complicated by a growing awareness that he also was sexually attracted to boys rather than girls. As he listened to the Bible teachings of his evangelical youth leader, he became increasingly concerned that he was hopelessly caught in a “sinful” gay sexuality. After drifting away from that youth group and sharing his struggle with his mother, he found his way to a Lutheran pastor and youth group who both affirmed his Christian belief and his gay sexuality. Thus Stedman entered college with essentially his faith and sexual identity intact. However in college as Stedman further examined his faith, he gradually began to question the essential truths of Christianity, and eventually identified himself as an atheist. However, he did not forget the love and community he experienced in the church, nor the passion for justice and making the world a better place that was at the core of the faith he had professed. He claims to have found peace and a sense of identity not believing in God that he failed to achieve in trying to believe in God. After going through a time of anger and rejection of all things religious, he entered seminary with the idea of understanding people of different religious faiths and promoting inter-religious understanding. He now serves as a Humanist Chaplain at Harvard University and speaks and writes widely on the values of secular humanist and inter-faith understanding. What I appreciated most about this book was Stedman’s insistence on the power of one’s personal story. For example one time he was entering a bar with some friends when they were harangued by three Christians were standing outside berating all the gay men entering the establishment. Instead of just walking by, Stedman engaged them in conversation, eventually sharing the story of his journey thru Christianity and struggle over identity to his current place as a gay atheist who appreciated the value of religion. He says that at the end of the conversation, the would-be hecklers thanked him for his authenticity and they parted in respect. Would that many gay bashing Christians learn the power of simply telling stories rather than seeking to pummel people with the Truth. So often we religious people hide behind our faith as if it is a shield against all that is different and threatening. More often in our fear we drive a wedge between those with whom we disagree, when in fact we have so much to learn from one another. In the last few years I have increasingly sought out opportunities to engage people whose belief systems are different than mine. I have found myself working alongside and talking with Jews, Muslims, Buddhists, Agnostics, atheists and spiritualists. These interactions have caused me to consider the foundations of my faith, while seeking to try and understand the foundations of another’s faith. 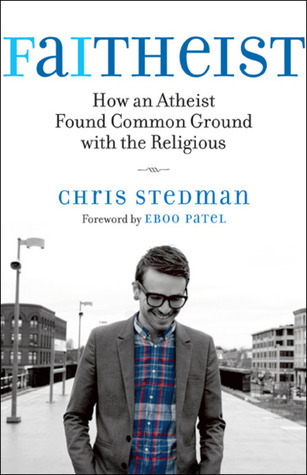 While not a Christian, Chris Stedman provides us with a helpful example of how we can live within our own belief system and still engage others meaningfully. While Stedman identifies with the new atheist movement, he is critical that for the most part new atheism is characterized by what it is against – religion – rather than what it stands for. Interchangeably using the terms “atheist” and “humanist,” he makes the argument that just as people from different religious traditions have much to learn from one another, so to believers and non-believing humanists have much to learn from each other. This book is an easy read, full of personal anecdotes that adds to our understanding of those who may share our passion for justice and peace, while rejecting our faith. We who claim to be Christian could learn a great deal from Stedman’s example of engaging openness to those who are different.